Arvixe was found in 2003 and they proposed their mission was to provide great service at a low price. 11 years later Arvixe claims they are still running strong and providing award winning support to their customers. Arvixe provides both Linux hosting (PHP, MySQL) and Windows web hosting (ASP .NET, MSSQL) plans ranging from shared hosting, VPS, reseller hosting, and dedicated servers, and thus they are sure their clients are able to find the right hosting plan for their site. Arvixe also states each of their webhosting plans comes with easy to install scripts and offers the ability to choose where the site is hosted, either in one of their datacenters in USA, Europe, or Singapore (coming soon). Arvixe claims that they’re constantly expanding their footprint to provide better and faster service to their customers, and thus all their datacenters use the latest technology and provide their customer peace of mind with redundancies and offsite backups. Arvixe are sure their server techs are the best in the industry and continuously stay up to date on the latest technologies and trends that help to improve their services further. United States – Arvixe utilizes 2 main data centers in the US, one in Dallas, Texas and the other in Chicago, IL. According to Arvixe this provides their customers with unparralleled speed along with redundency for extra security. Europe – Arvixe data center in Amsterdam, Netherlands is proposed to provide their European customers with the better speeds in Europe. This data center is also connected back both US data centers for redundency and ease of access. Singapore – Arvixe also plans to bring on support in the Asian market with the launch of their Singapore data center in mid 2014. For more information please check Arvixe data centers web page. According to Arvixe website they provide the full range of web hosting services start from domain name registeration, and low cost personal hosting plans with free website builder in the areas of linux hosting and asp .net hosting, then reseller hosting and business hosting plans that might be interesting for web designers and small businesses, as well as VPS hosting, or managed dedicated servers for web developers and larger corporate clients. – Free Site Builder, Online Store, etc. – Free Free SSL Certificate For Life, etc. Completely managed dedicated hosting, etc. If a client wishes to cancel his/her account at anytime within the first 60 days of the service, Arvixe promises to provide a full refund. If during any month, Arxixe does not live up to their 99.9% uptime guarantee, clients qualify to receive a refund on that month’s hosting fees. Arvixe US-based customer service and technical support representatives are working 24 hours a day, 7 days a week. So, the issues can be resolved as quickly as possible at anytime. When moving from another web host, Arvixe technical support representatives can assist to transfer website content over to their servers. This service is provided at no cost. Arvixe claims that all fees are represented clearly on their website and one can be sure that there will be no extra charges or fees. Below you can read Arvixe reviews submitted by our site visitors who were (or used to be) Arvixe customers at the time of writing the review. 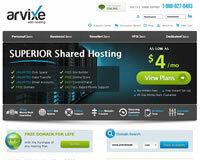 Arvixe the best hosting provider ever among several most popular hosting providers available. I have used Arvixe hosting for many years and have nothing but positive things to say about them. Customer service is great and they are always very helpful! I have tried many web hosting solutions over the years and have found Arvixe to be the absolute best! Great service and support. Always very helpful! Arvixe offers excellent features in their web hosting packages. A great web host with excellent support. I highly recommend it to my friends, colleagues, families and others who did not known this awesome services. I have hosted in Arvixe.com for over 2 months. So far has no problems. The customer service is good and professional. Server reliability is high. I chose Arvixe as the offer a great ASP hosting plan at a very competitive price. Tech support is quick to respond and have always been able to help in all instances. Would highly recommend them as a good all round hosting provider with fast hosting and even faster support! I chose Arvixe after researching recommendations from PC and Business publications and finding them as the top choice in several. My experience with them has not disappointed. I have needed technical support several times (so far) and have received fast, friendly service and resolution every time. After working on my ASP.NET application I needed to host it for as cheap as possible. Arvixe not only looked reputable but had the plan I wanted. Not to mention the extra stuff they give you when you choose them as your host. They also provide great support and actually seem to care! That always works, so I recommend Arvixe for their awesome service. I host 5 different client websites through Arvixe and will not go with anyone else. It was created by developers for developers and it exactly what I was looking for when I decided to switch from my previous hosting company. Fantastic prices and amazing solutions to problems that other hosts can’t match. Thanks Arvixe, you have made a lifetime customer. I chose arvixe among best web hosting services. I feel that I’ve made an absolutely Right Choise! It has a wonderful performance at very fair price. Me, give it as Highly Recommanded! I purchased my Domain in Fab, 2013 and hosted it on Many Hosting Providers but at last I found Arvixe and Got Hosting Account October, 2014. Now I feel this is my Best Choice among all Hosting Providers. Arvixe is just Great Hosting. Especially I really Appreciate Arvixe Support because whenever i feel any problem Arvixe Support provide me Quick response and resolved my issues. I own 3 domains,all on Arvixe Hosting.Domains buyed from Arvixe,too. The fast response from Arvixe Customer Support made me to continue to use their services. I highly recommend using Arvixe. At glance, I highly recommend to use Arvixe services. So,far they have given their services at a level of 100% satisfaction and very fast customer services as well. Really speaking, Arvixe is very good and keep promises, no hidden charges, and no two rates in second year like some other services. I have another two domains currently under some other service providers, and I will move them to this excellent Arvixe hosting services. I looked around for a few weeks, trying to find a web host that would fit my criteria for cost, dependability and ease of use, but was not having much luck. A good friend of mine who specializes in website and web application development suggested looking to Arvixe. Needless to say, his suggestion was right on point with what I was looking for. I am a huge fan of Arvixe for several reasons: low monthly cost, wonderful technical support and the fact that I have never had any issues whatsoever with my service. My website, email and database have been running smoothly with no problems. Thanks to the awesome people at Arvixe! I had hosted with a few other companies before and were ok with a couple of them. This time I wanted to find something a little different, in terms of price and tech support. I tried Arvixe and have become 100% satisfied with them. I have never had any problems with them at all. My site runs great, email work perfectly and the few times have interacted with support? flawles! I would recommend them HIGHLY! I’m a small business owner who recently started using Arvixe to eventually start advertising on the WWW. Their web hosting services are easy to understand and they provide tons of documentation to help you navigate through various products. I plan to continue using Arvixe for all my future hosting needs. Arvixe is a great host server company as they offer inexpensive plans for small businesses without all the junk from a bigger company like GoDaddy. I intend to move my other website over to arvixe after it’s subscription ends. The customer support is also quick at responding. I appreciate their services. You know you have a good host when things are working quietly and smoothly in the background and you don’t really think about it because there are never any problems or downtime. That describes Arvixe very well. They offer an amazing variety of web applications to choose from for building websites, too. I’m glad I did my research before choosing the BEST host out there! I have used other web hosting companies and arvixe blows them all out of the water. There customer service is top notch and always resolve issuse very quickly. There selection of options for there hosting is great. I will always recommended Arvixe. We switched to Arvixe from a more expensive hosting company and we’re pleased with the service and support. Every time we had a problem the support team was responsive and we got it figured out. If they can keep the pricing competitive they’ll remain our #1 choice for hosting.